Mikuni (Thailand) Co.,Ltd. was commenced more than 25 years ago and has continuously expanded and grown in the business of Manufacturing carburetor and automotive components with the technical assistance provided by Mikuni Headquarter, A leading manufacturer of injection-related products for motorcycle and automotive parts. 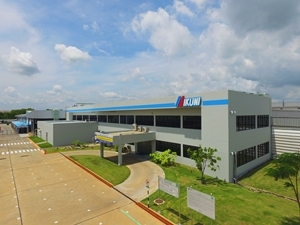 As the leading in the Mikuni group of ASEAN region , Our company airms to strengthen the capacity of production technology and product development continue of "Quality-conscious and environmentally friendly." We are looking for the persons with outstanding competencies, enthusiasm and team spirit to join our growing family. Selected candidates will recive competitive remuneration package with the opportunity to advance in work. We believe that human resources are the most valuable asset of an organization,and we are committed to developing our personnel as valuable resources has the potential to help develop create an organization current and the future. Banwha , Bang Pa-In , Ayutthaya 13160 , Thailand. Copyright © 2016 MIKUNI THAILAND .All Right Reserved.